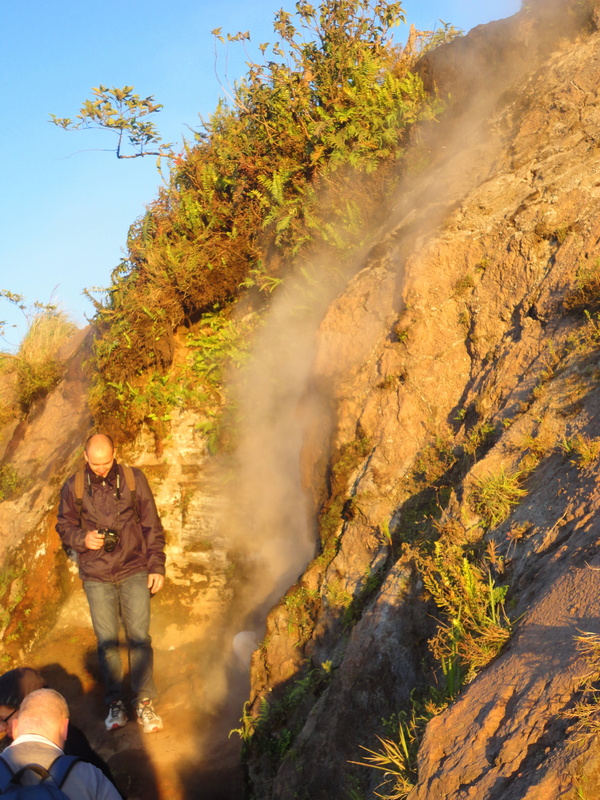 Climbing a volcano..wow..that too which is active..super wow…and you can see hot steam coming out when you reach the top..now this is something I have to see.. 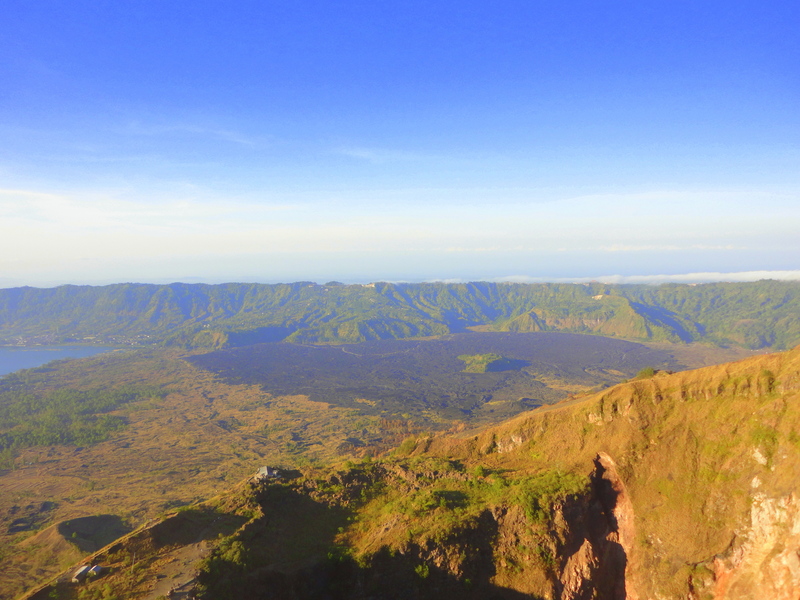 When I was visiting Indonesia, trekking to Mt.Batur, Bali’s active volcano was top on my list of things to do. 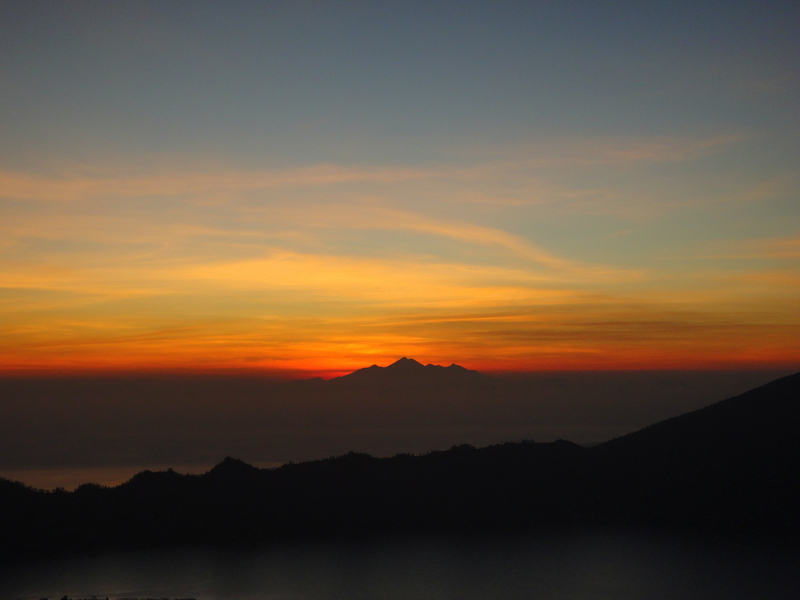 I booked myself with a local trekking club and the plan was set to go for a sunrise trek. 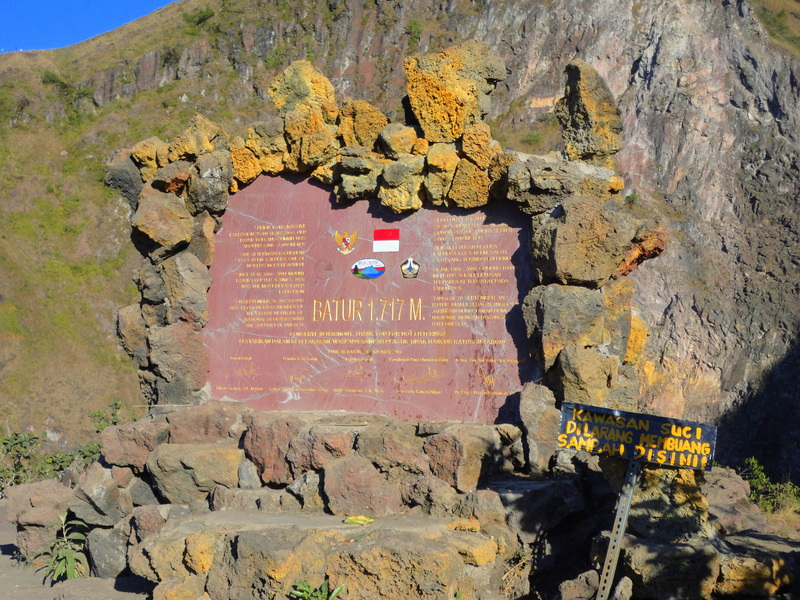 We had to start at 2am from Bali and by 3.30am we reached the base of the mountain. From far, in the moonlight we could see our mountain standing high. Our guide met us at the base, gave us some head torches, some instructions and off we started. 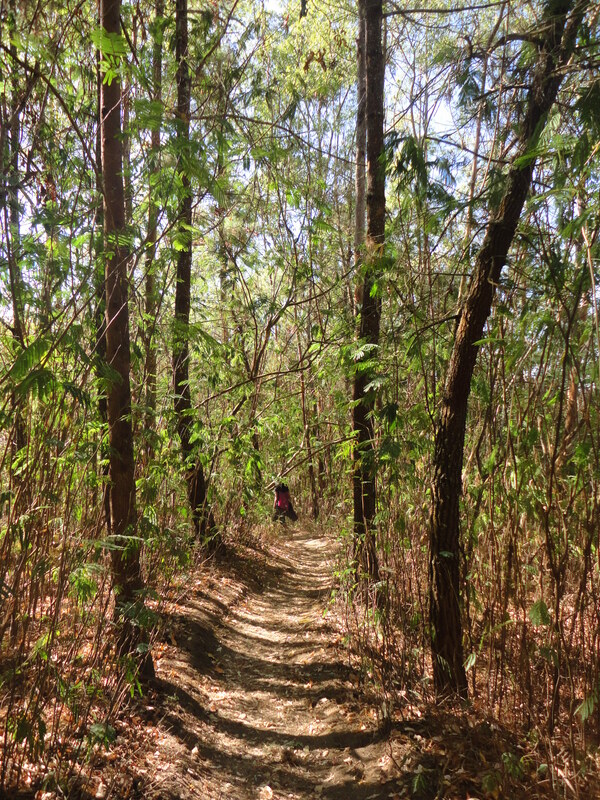 We passed though the forest with its tall trees and very quickly we hit the slope which we had to ascend. It was dark and the forest was mystical. According to our guide they were 2 routes, one route which most of the people take and the other one was this through the forest which is a bit tougher. Lucky us :). There was lot of dry gravel on the path which makes the climb slippery. 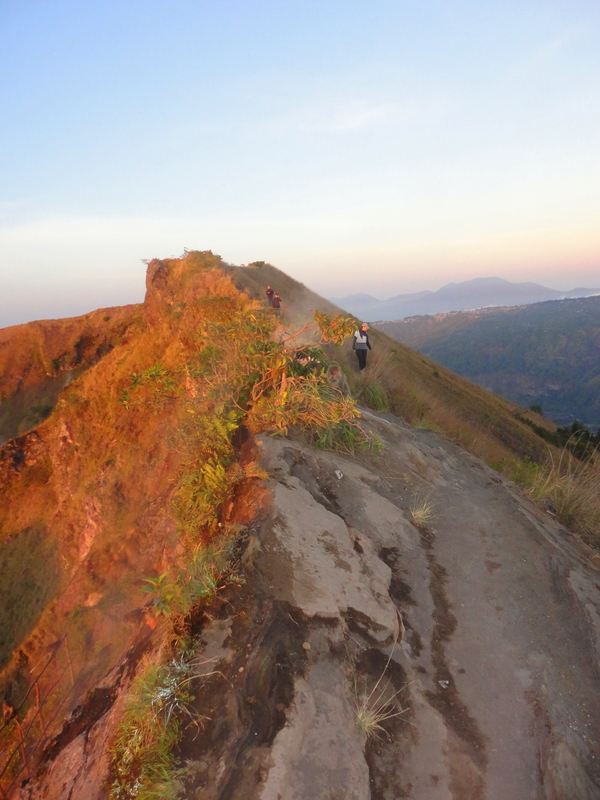 After 2.5 hours of climb we managed to reach the top just as the sun was rising. What a beautiful sight it was, golden sky and a fireball slowly coming out of it. There were lot of people coming up and it was amusing to see so many trekkers from different countries with their gear’s, bags, equipment, different trekking clothes which I rarely find in our treks. Then our guide took us a bit further down, where he showed us how our breakfast is to be made. He got some eggs n bananas. On the top of the mountain we can see hot steam coming out of the ground in certain places. 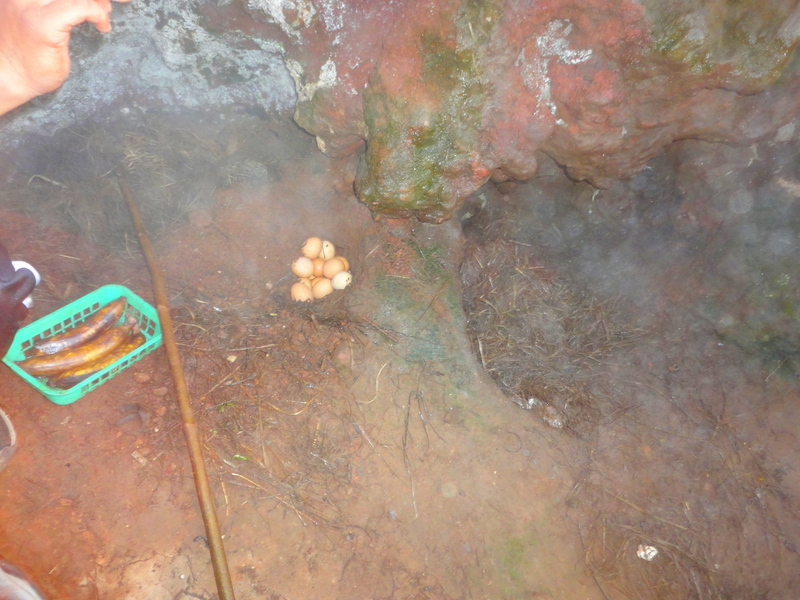 So he just dug a hole in the ground from where the steam was coming, placed eggs and banana’s in it and covered it up with grass and dried hay…tada..20 mins later our breakfast was ready.. Boiled eggs and bananas which were cooked in the volcano steam. 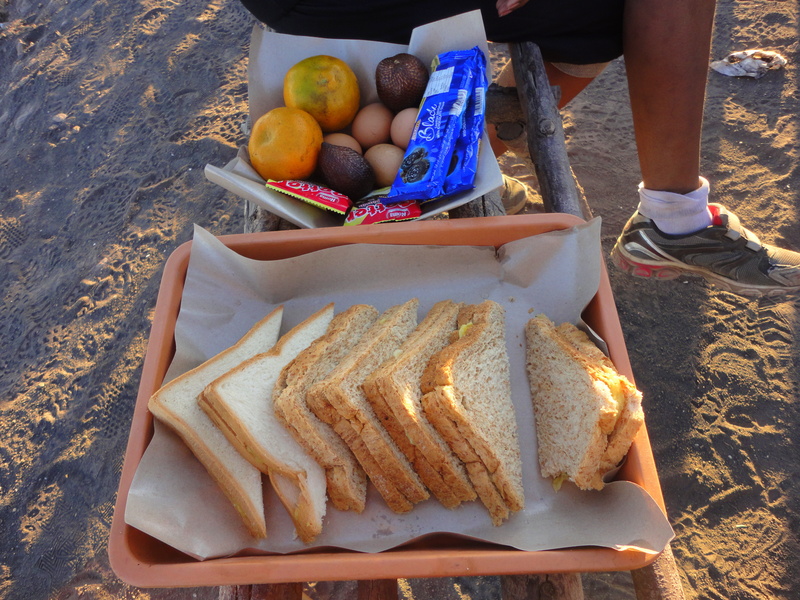 He gave us some sandwiches made out of the mashed boiled banana’s and eggs. Was one of the best breakfasts I had on a mountain. Cooking eggs in the Volcano stream.. Steam coming out of the mountain..
We then went around the top and we saw the volcano crater which was a dark pit in between. 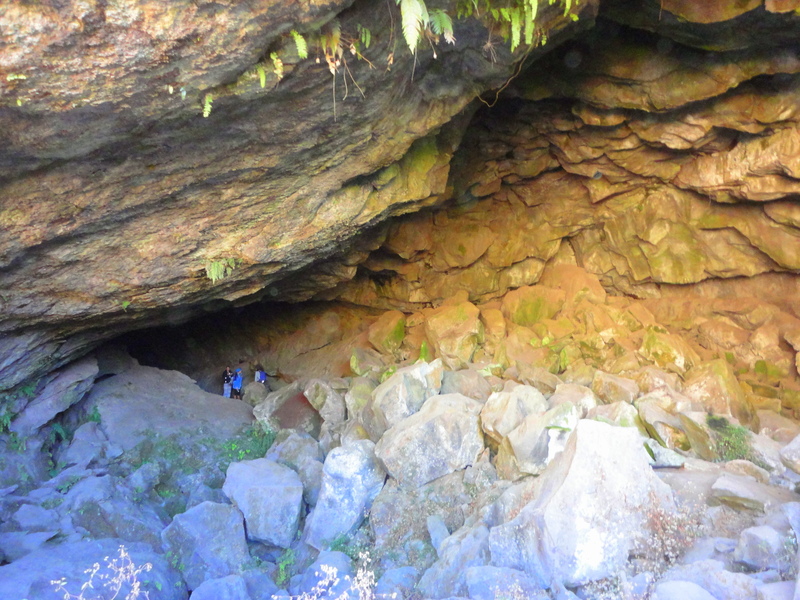 It is typically circular in form within which magma erupts as gases and lava. Surprisingly there was a green patch of land in middle of the crater and when we asked how that little land escaped while everything surrounding it, was in ash. The guide said it was a temple and it was saved, hence the local’s till today come there quite often and pray. 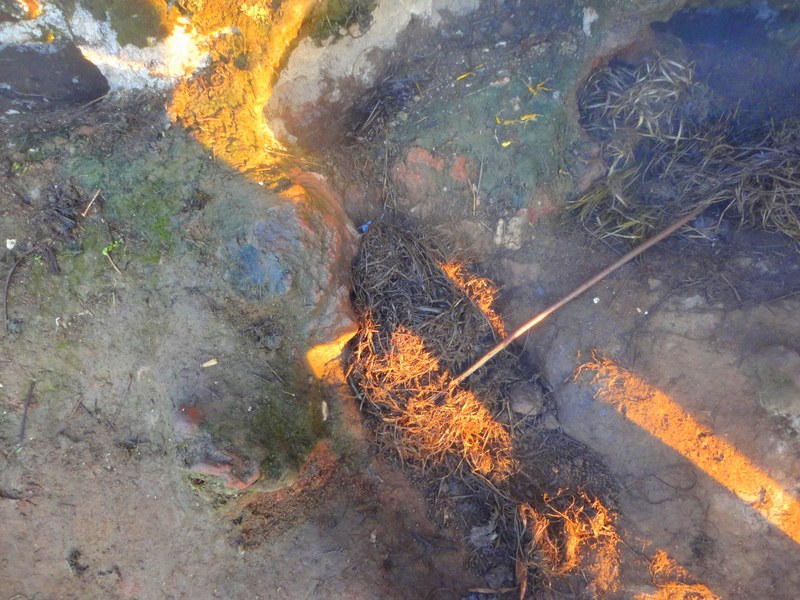 They also make offerings of animals to the volcano to keep it calm. Unlike in India where they kill the animals, here they just leave the animals alive on the mountain as an offering. 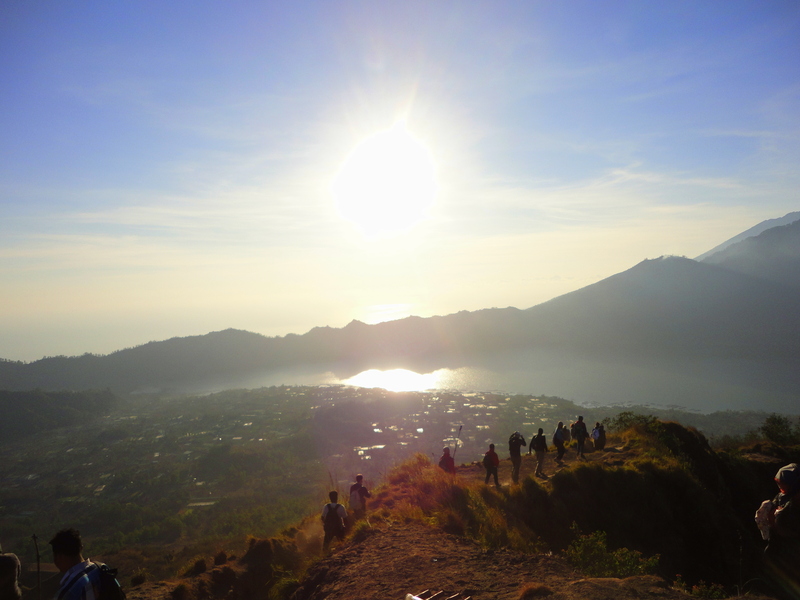 This I noticed a lot in Bali, as I saw people praying to lot of tree’s, sea, mountains..
We then saw some caves and some views around the mountain and started our descend. 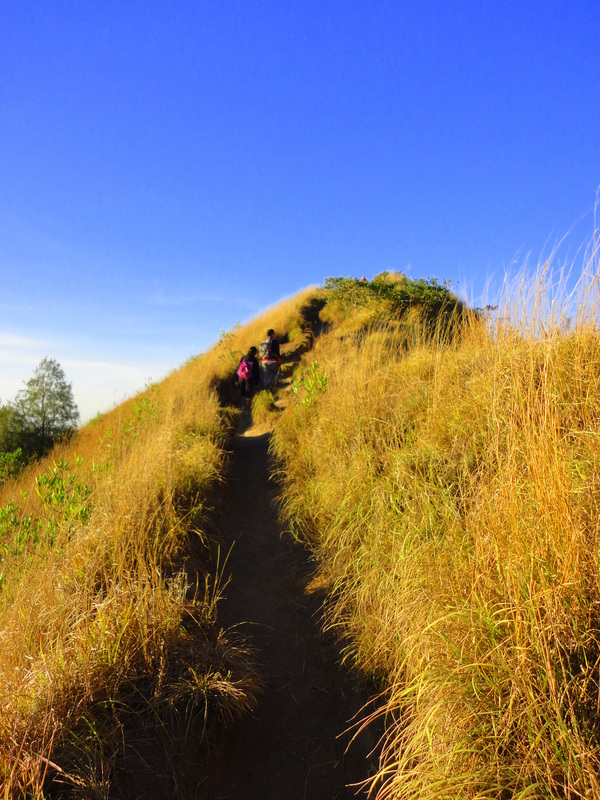 As the sun was up, it was super hot and all the dry ash gravel on the slopes did not make it easier to climb down. By the time we reached the base, I was covered with a thick layer of ash dust from head to toe. Now I understood why we started it at 2am because as the sun goes up the heat was too high. After we reached the trees and out of the sun, the descend became easier. I started talking to our guide a young 28 year old, who along with his friends started this trekking club BaliVolcanoTrekking (http://www.balivolcanotrekking.com/), out of passion for adventure. 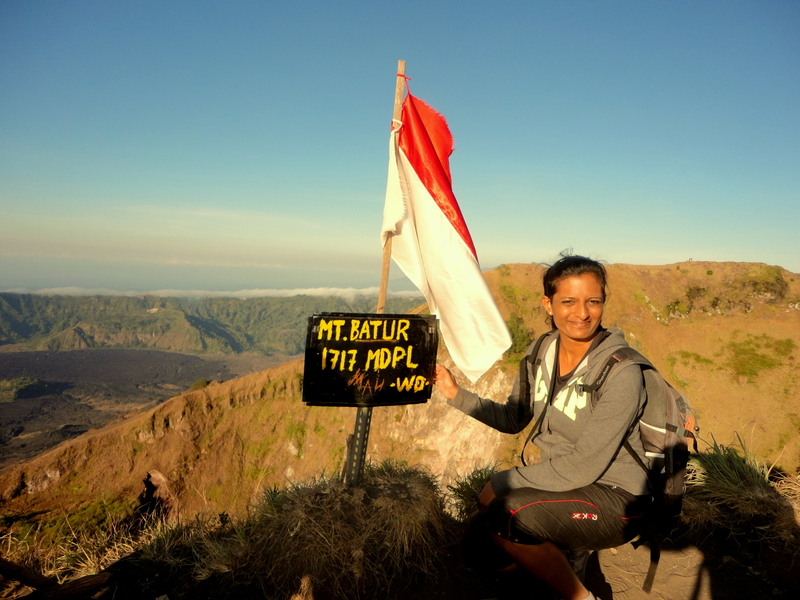 We discussed about the procedures, costs(they charged $50 per person for this trek), training they have undergone to become a licensed trekker and guide. I told him about GHAC and how we did things there. 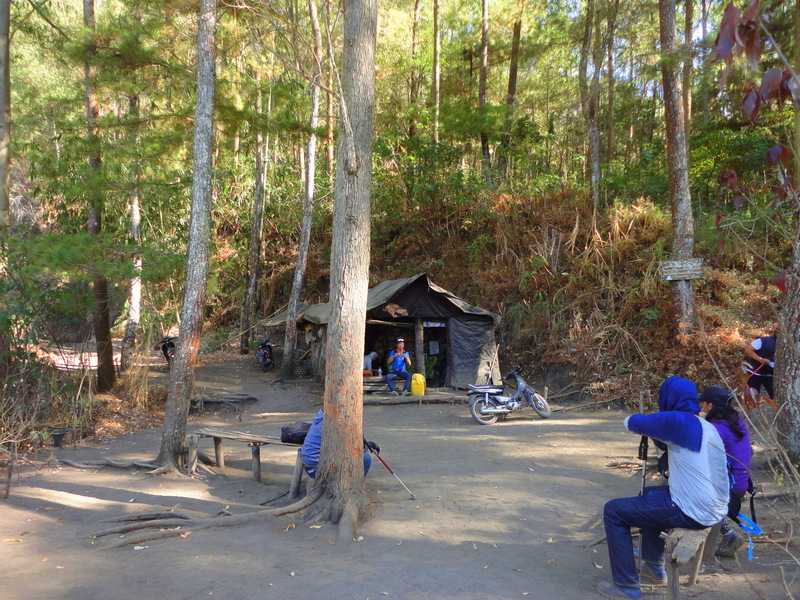 Actually learnt a lot on how adventure clubs differs from their country to ours. Told him if he ever comes to India I will take him on a GHAC trek, this time I would be the guide :). 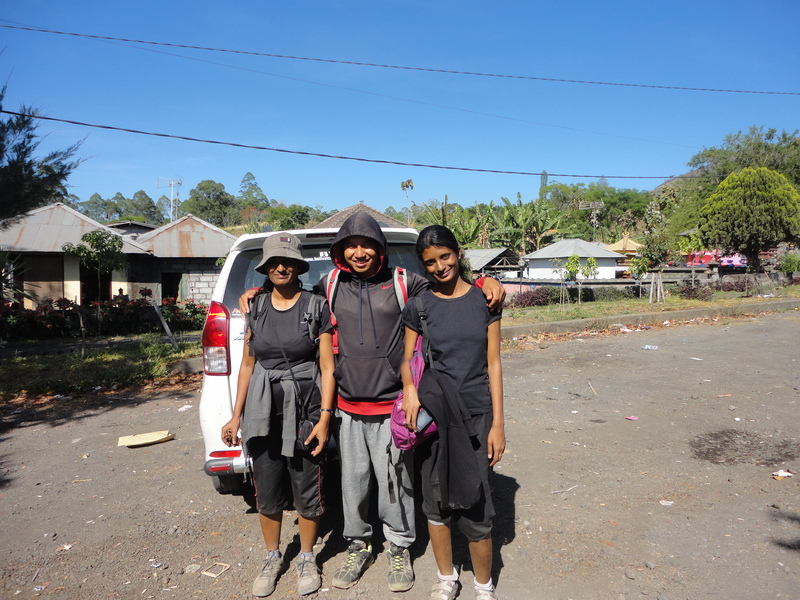 We reached the base around 10.30am, said our bye’s to our guide and started back to Bali. Previous Post Children of the forest..